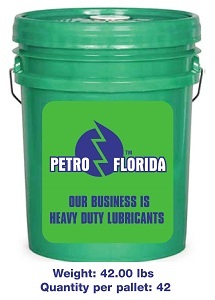 PETROFLO MULTI-PURPOSE HYDRAULIC OILS are formulated from the highest quality of mid-continent base stock specially refined to meet and cope with the most rugged lubrication needs. The blended base oils are then treated with a host of select additives to impart the diverse array of qualities that are desired. 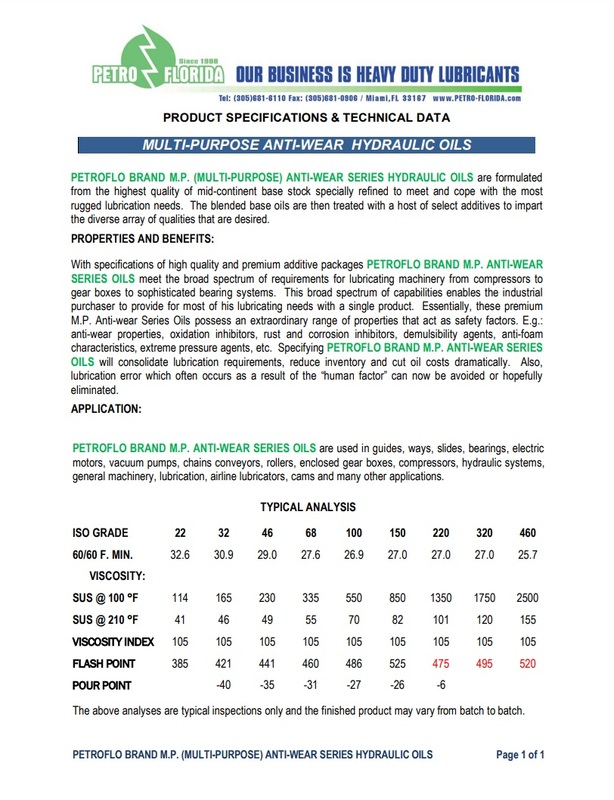 PETROFLO MULTI-PURPOSE SERIES OILS are used in guides, ways, slides, bearings, electric motors, vacuum pumps, chains conveyors, rollers, enclosed gear boxes, compressors, hydraulic systems, general machinery, lubrication, airline lubricators, cams and many other applications. Transmission oils in mechanical transmissions should provide: ease of gear shift, reduced wear, reduced coefficient of friction, heat dissipation from friction surfaces, protection from corrosion, vibration suppression and removal of wear and contamination products. Transmission oils work under lighter conditions than motor oils, so they do not feel heavy, and they experience high loads. The operating temperature of the oil in the transmission units varies depending on the ambient temperature and can reach 200 ° C, and at points of contact of the teeth, there is often a brief overheating of up to 300 ° C and higher. As a result, there is increased wear and tear and pitting (pinching the gear teeth). Therefore, the main requirement for transmission oil is to prevent damage and reduce wear on the working surfaces of gear and worm wheels. For this, sulfur is added as a component to reduce friction in the additive package to the transmission oil. Another requirement for transmission oil is the provision of power transmission with minimal losses, which depends on the coefficient of friction of the material of the teeth and the viscosity of the oil. In other respects, the requirements for the transmission oil are approximately the same as for the motor oil: a wide temperature range of application, stability, and no corrosive effect on the part. In the process of the transmission oils, additives are produced, the oils are oxidized and contaminated, so they must also be changed. The timing of oil change is different and depends on their quality, specific operating conditions and other factors. In modern cars, oils are changed, as a rule, at a run in the range from 24 to 50 thousand km. In some foreign cars (VAG), when using the recommended gear oils, replacement is not performed during the entire service life, most often in the leading bridges of cars with hypoid gears.